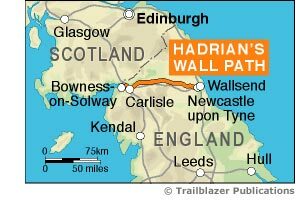 Hadrian’s Wall Path, 84 miles (135km) from end to end, follows the course of northern Europe’s largest surviving Roman monument, a 2nd-century fortification built – in the border country between England and Scotland – on the orders of the Emperor Hadrian in AD122. Hadrian’s Wall Path is the first National Trail to follow the course of a UNESCO World Heritage Site. This week-long walk is regarded as one of the least challenging of the National Trails. New 5th edition - as with all our new editions entirely rewalked with all accommodation and each place to eat fully checked. Listen to a podcast about the author's walk along Hadrian's Wall Path.